Volunteers are the lifeblood of Little Flower – whether serving on our board to provide leadership and direction while helping to financially sustain the organization or helping out in the office or serving as a mentor to provide a special one-on-one relationship with a child in need. Our volunteers make significant contributions of their time, talent and resources, enabling us to better serve the children and families to whom we dedicate our work. Your efforts are not only needed but greatly appreciated! Little Flower is always looking for talented individuals and encouraging them to share their skills and gifts to benefit those we serve. Love photography or like to write — perhaps you could volunteer to help out with our newsletter? Want to share your love of drawing with someone — perhaps a mural at one of our homes for individuals with developmental disabilities? Whatever your talent (photography, printing, writing, graphic design, mural/wall art, knitting, etc.) sharing it makes it that much more special. Hosting your own fundraising event is a great way to support Little Flower, involve your friends and family and have fun at the same time! This is a great opportunity for church or school groups, office fundraisers, volunteer organizations or dedicated individuals to make a difference and help those we serve. For more information or to discuss your ideas please contact Carrie Sackett at 718-875-3500 ext. 5990 or at sackettc@lfchild.org. Recently hosted a fundraising event? Send us a picture or share it with us on Facebook, Twitter, and Instagram @littleflowerny! A basic and important value a mentor can provide is assuring a child that there is someone who cares about them. Having a mentor is associated with better outcomes, such as fewer depressive symptoms, less stress as well as better overall health and educational attainment. Mentors can help keep children in school, improve their self-esteem and overall, provide a positive role model and build relationships of trust and respect. If you would like to participate but have limited availability, you can help by training prospective mentor, sharing your own experiences as a mentor and/or providing guidance to current mentors. To learn more about becoming a mentor with Little Flower, please contact Maureen Fox at 718-875-3500 ext. 5040 or at foxm@lfchild.org. 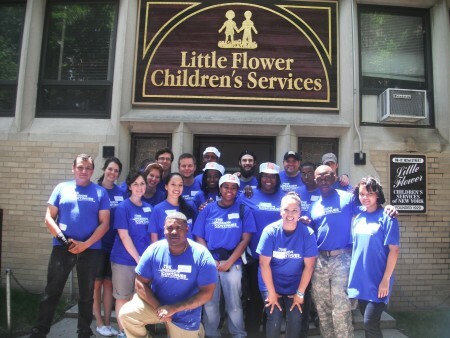 Little Flower’s Young Professionals Committee (YPC) brings together emerging leaders in NYC and Long Island to build a community dedicated to raising awareness of Little Flower’s mission and work through volunteering and fundraising activities. The YPC provides a wide variety of networking and leadership development opportunities to connect with like-minded young professionals, such as volunteer opportunities and community fair information booth staffing, holiday party planning for foster children in Brooklyn and Queens and networking events. To learn more about the Little Flower YPC, events and activities and how to join, please contact Maureen Fox at 718-875-3500 ext. 5040 or foxm@lfchild.org.